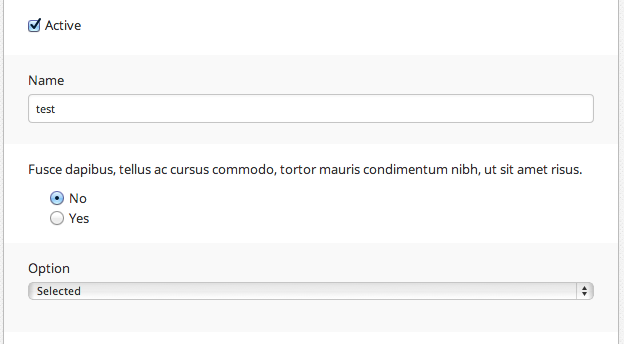 I'm doing a slight redesign of some forms and I'm trying to get good consistency amongst fields. I've placed the label above the field for most of the forms, as some of the labels are quite lengthy, and this seems best for readability. This layout works well - but breaks down for a simple label-checkbox scenario. I've added a screenshot to show. What's the best way I should lay out that first field of just a label+checkbox? It seems to look best as I've got it, but its very inconsistent having the label on the right, and all on the same row. But it looks illogical having a one-word label on one line and a single checkbox below it. Also, side-question: you can see in the 3rd field, 'no' is first. I didn't design this form. I feel like 'yes' should always be first, even if 'no' is the default. Am I right in this? I don't have any sources on hand to back up my decision but I have studied UX and browse this forum quite a bit so I think my decisions are based in reason. Feel free to correct me. This layout is consistent; it's the lack of a question to prompt a checkbox response that is throwing you. Otherwise, it would be formatted the same as the radio field. And, consequently, If you changed the checkbox/label-only pattern, it would throw off the radio pattern. I think your side question is the bigger of the two and it really depends on the context of what's being asked. In general, default yes on a radio button that is neutral/beneficial is common practice. Even without the connotation, good ole Mr. Nielsen suggests always providing one by default, and even offering an explicit neutral option ("None") as opposed to leaving the radio field blank. I'm skeptical of the neutral option in some cases because it doesn't account for user errors. If you have a blank radio it should throw an error and force a decision. If you only have a yes/no answer, there's a good chance a single checkbox can do the job (e.g. check for providing something beneficial by default). Not the answer you're looking for? Browse other questions tagged usability forms checkboxes or ask your own question. 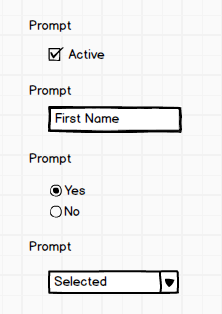 Why don't most forms have a hover state?